There are many things that go into the standard maintenance of caring for a dog. It needs to be fed, shampooed, walked and the nails need to be cut regularly. You can do this yourself with the proper instruction. After you get the jist of it, the time it takes for you to cut a dog’s nails will be drastically reduced. Trimming your dog’s nails will you’re your dog looking its best. Here is how you can cut the dog’s nails. Follow these instructions. Read on for more instructions. Put your pooch on a raised platform to make the dog company. Use a non slip mat so as to avoid any possibility of injury. 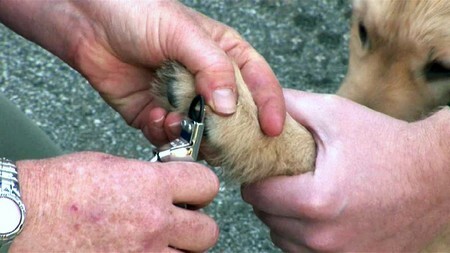 If it is possible, have a person help by holding the dog while you cut the nails down on the animal. Put the nail clipper over the edge nail. Be sure to position it only on the white section of the dog’s nail. Blood vessels are in the other section. That appears pink. If you cut into the pink areas you can cause the paw to bleed. This is painful. Apply pressure to the nail clipper evenly, with firm pressure and smooth. Do not force the cut nail off. If you apply the pressure correctly the dog nail will come off in one piece. Use a file to make the edge of the nail smooth. You can allow the dog to smooth it out gradually by walking on rough surfaces, or do it after you remove the nails. Be careful not to cut the dog’s nails too short. If they are cut too short by mistake, use styptic powder (or a pen) to stop all the bleeding that will occur. If the dog’s nails are black cut the section that is white. This will not cause bleeding. Please remember to cut the dog’s dew claws too. These nails are the ones that are located further up the leg and don’t touch the ground when the dog walks. When cutting the nails, the least amount cut the better. The dog’s nails should naturally protrude over the pads of the paws. Take care not to cut too short. Cut the dog’s nails on a regular basis. For a dog to have to walk on long nails on a regular basis, can lead to infection, damaged nails and even pain and bleeding. You can buy several kinds of nail cutters. They even have them specialized according to dog size and even breed.